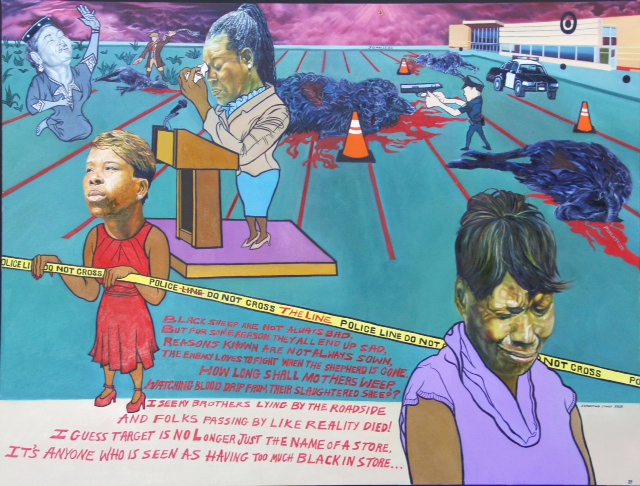 The oil painting highlights the grief of mothers, Mamie Till (mother of Emmett Till), Sybrina Fulton (mother of Trayvon Martin), Lesley McSpadden (mother of Michael Brown) and Gwen Carr (mother of Eric Garner), who lost their sons too soon due to unjust circumstances. In it, Jones revisits the prominence of understanding a mother’s pain and the actions that led to their heartbreak and tears. 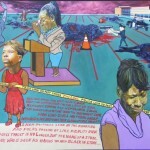 “One of my primary reasons for painting, “Black Sheep Are Not Always Bad,” was for viewers of all nationalities to understand how far back black people have had to suffer just because of who we are and the rich spiritual history we are connected to. When creating this oil painting I was hurt and baffled by how the world surrounding the black community could still have such a hard time feeling what the mothers are going through. In this work there are two scriptures that paint the picture of Who cries for us (John 11:35) and why I personify us as sheep (Psalm 44:22). The enemy loves to fight when the shepherd is gone. Watching blood drip from their slaughtered sheep? And folks passing by like reality died!